Settling into its second residency in the idyllic grounds of Boughton House, the festival will reflect the poem’s call for pause, exploration, discovery, and finding the treasure in the everyday. Focused on building for a sustainable future, this year the festival reflects and celebrates the grassroots. 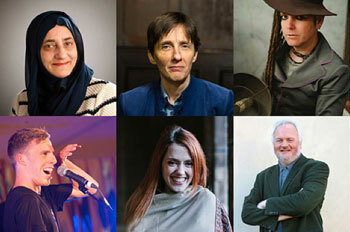 The programme introduces a rich and diverse array of thinkers, poets, musicians, theologians, covering themes including peace, ecology, climate change, community, forgiveness, immigration, fashion, mental health, interfaith, sexuality, and media. On the programme alongside the Bogside Mural Artists, best-selling writers A L Kennedy and Matt Haig, is spoken word artist Harry Baker whose recent TEDx talk has garnered more than 850,000 views. A diverse musical line up brings together symphonic rock choir The Polyphonic Spree, India-inspired international singer Kiran Ahluwalia and Mercury- nominated The Unthanks. Irish singer-songwriter Duke Special will be performing his Under the Dark Cloth, a work originally commissioned by the Metropolitan Museum of Art in New York. The ideas stream includes reverends Kate Bottley and Guardian columnist Giles Fraser, award-winning writer Madeleine Bunting, renowned theologian Dr Paula Gooder, Bishop Pushpa Lalitha, the first woman to be ordained bishop in South East Asia, Chief Executive of Stonewall Ruth Hunt, author and co-founder of Windsor Hill Wood community Tobias Jones, Rector of St James Piccadilly Lucy Winkett, journalists Abdul-Rehman Malik and Peter Stanford, and Paul Vallely, biographer of Pope Francis. A broad range of comedy, performance, circus, aerial theatre, spoken word, and magic run throughout the festival including Ava Vidal, Barbara Nice, Andy Kind and Paul Kerensa, alongside worship and the full festival Sunday morning communion. Four days in a ‘bright field’ bursting with lush natural beauty, creating a community of hope, challenge, inspiration, and creativity that ripples through daily lives long after the festival ends. Greenbelt invites festivalgoers to come and explore, and leave wanting to live more imaginatively, creatively, and generously. All events take place at Boughton Hall, Northamptonshire, 28-31 August 2015.